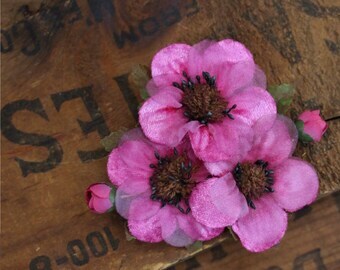 This vintage style hair flower clip is made from reproduction vintage millinery supply. 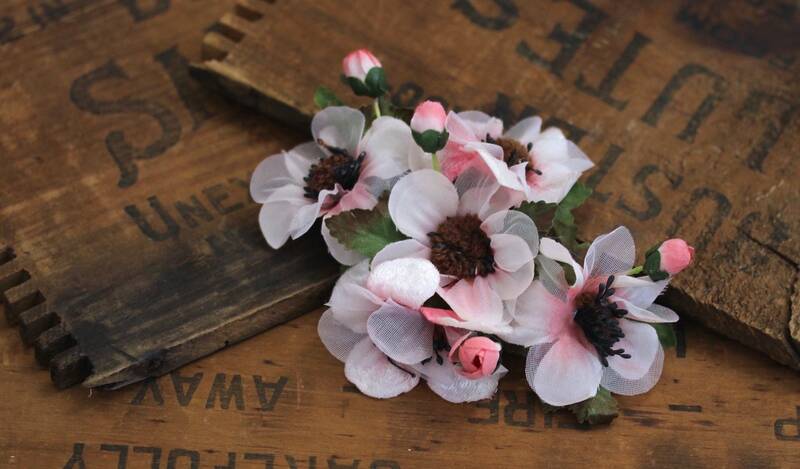 Dreamy anemones with mixed velvet, silk, and tulle petals of light pink blush each have black stamens surrounding curly brown yarn centers and are set together atop green leaves and buds. > Size: Approximately 3" x 5"
Red Hair Flower Clip, 1950s Floral Fascinator, Red Hair Accessory, Vintage Headpiece, Dahlia Hair Piece Womens Retro - "Summer's First Kiss"
White Hair Flower, Large Flower Fascinator, Pinup Hair Flower Clip, White Floral Clip, Hair Accessory, 1950s Poppy - "Starry Eyed Splendor"
Orchid Hair Clip, Coral Pink Fascinator, Tropical Headpiece, 1950s Floral Headband, Flower Clip Adult - "Papaya Berry"
Blush Pink Fascinator, Bridal Hair Flower, Wedding Headpiece, Floral Hair Clip, Vintage Hair 1950s, Peony Hairpiece - "Pink Champagne"
Large Hair Flower, Pink Fascinator, Dusty Pink Hair Clip, Mauve Hair Accessory, 1950s Floral Headpiece Pinup Hair - "Pick Me Up in Paradise"